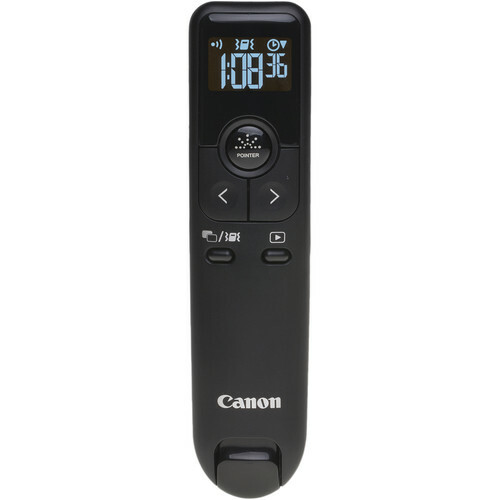 The PR100-R Wireless Presenter Remote, in black, from Canon features a vibrant red laser that is approximately twice more visible than a standard red laser. The PR100-R is compatible with Microsoft PowerPoint and Apple Keynote on Windows and Mac computers, and has a 50 ft wireless range that allows the freedom to move around in large areas. The PR100-R has two large slideshow buttons, a large laser pointer button, a lock button that ensures you won't switch pages by accident, and a play button. Aside from these functions, the remote also lets you set up a timer on a backlit LCD to monitor the duration of your presentations, and furthermore allows you to program vibration alerts to warn you of anything you want to keep track of, such as when only a minute is left in your presentation. The LCD also shows the wireless signal strength of the remote. The remote instantly syncs up with your presentation software when you connect an included plug-and-play USB receiver (USB 2.0 interface) into your computer and then set a selector switch on the side to either PowerPoint or Keynote (besides these, the selector switch can be set to Off). The first time you connect the receiver to your computer, there will be a simple and mostly automatic setup process, but thereafter synchronization will be plug-and-play. The PR100-R is powered by two AA batteries (included). Box Dimensions (LxWxH) 9.6 x 5.4 x 1.5"
PR100-R Wireless Presenter Remote (Black) is rated 4.8 out of 5 by 53. Rated 4 out of 5 by Andrea N from Comfortable to hold and the timer works well! I received a free presenter remote to try and to review. I like the size and shape of the presenter remote. It felt comfortable to hold and didn't cause me to fidget with it. The laser pointer is stronger than most I have seen, I paired quickly with my laptop and worked flawlessly. At first I was overwhelmed and a bit distracted with the timer feature, but as I played with it and became more comfortable I found it to be a useful feature. I also like that it is white. Most everyone has black ones so mine won't get confused with others! Overall I would recommend this product as it was reliable and useful for me in several presentations so far. Rated 4 out of 5 by Ian from Purchaser Review Unlike the other about 50 reviews I did not receive the PR100-R free in return for a review. My cost was about twice that for similar presenters. However, having had less than stellar experience with three other presenters, I decided to try the Canon. I have had excellent customer support for their printers. Instructions confusingly combine English and Spanish, but more important are incomplete. There is no description of the screen icons, and no mention the screen goes blank in about 10 seconds. So to know the time left to talk you must press a button. There should be an option to keep the screen visible. This also means there is no visual indication the Presenter is on other than switch position. I am unsure of the function of the launch slide show button, and its function is not mentioned in the instructions. I do like that the computer connection is automatic - just insert the dongle. Rated 5 out of 5 by Amy K from Love the product I received this presenter in exchange for an honest review of the product. I am a teacher and also make large group presentations, and I love this presenter compared to many others I've used. It comes with a case, clear instructions, presenter, and battery. The size is compact, but like a remote, so the buttons are easy to find and use without looking or fumbling. The timer is helpful and unique. My favorite feature is that the USB receiver fits into its own place on the presenter. I am forever losing those things and helped me be much more organized. Overall, this is a great product and a great value for the money. Rated 5 out of 5 by Tavan J from Love this Presenter I received this wireless presenter free in exchange for an honest review. The presenter is small, compact, and lightweight, making it easy to handle during my presentations. Though small and compact, it is durable, and it has a lot of great features that was easy to learn to use. The presenter came with batteries, a receiver, a carrying case, and a user manual. It had sufficient range in a medium to large size room, which extended me beyond the suggested 50 feet. I think the timer is the best feature of the presenter as it gives a gentle vibrations when the time is expiring. I would highly recommend this product to anyone that does presentations frequently, or infrequently. 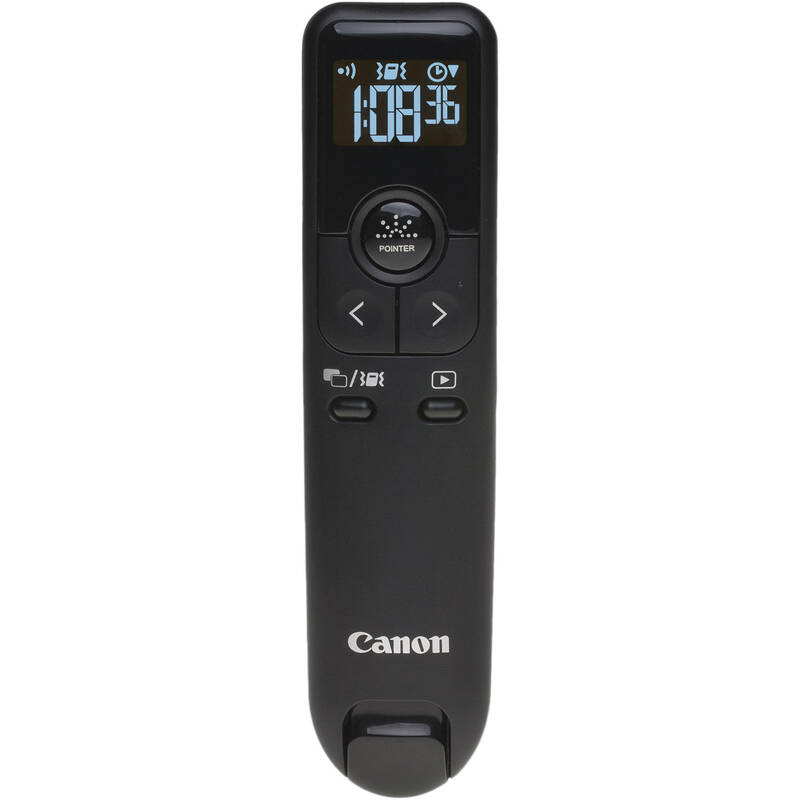 Rated 4 out of 5 by Anonymous from Good Product I received a free sample of the Canon PR100-R- Presenter Remote. I like the available features. It is not intuitive but once the instructions are understood it is easy to operate. The timer feature and buzzing at end is interesting. I found no issues with range from the computer for presenting. The laser is solid and works well from distance. Aesthetically it is a little large for my tastes. I would not have chosen white as the color. When presenting I prefer the device to be almost hidden/concealed in my hand instead of becoming it's own prop. I like the product. I would recommend it for its features. Rated 5 out of 5 by NikkiM from Love the remote Overall the presenter remote exceeded my expectations. I especially like the addition of the timer function. It really helped me stay on track and know when I should be moving on to the next slide. It will be helpful for all users include Mac users. It was really plug and play. Once I inserted the usb and open the presentation it was ready to go. The laser is really strong. I used it on a white background and also a painted wall without any issues. In addition, there was no delay for slide transitions. It even worked with my animations. I would definitely recommend the presenter remote to colleagues. Rated 4 out of 5 by Ginger1155 from AMAZING FOR PRESENTATIONS I received a free Canon PR100-R White Presenter Remote and with this remote i was able to make my business presentation much more organized for my co workers. i was also able to give this to my son so he could use it in his class project and he was beyond ready fro everything. Overall, i loved this remote but found one feature that could use a bit of improvement which is its compatibility mode with google docs. I was able to perfectly sync it to Microsoft windows but when it came to google docs i pressed the present button and it did not go to the full screen like it had done with Microsoft word. Rated 5 out of 5 by Tiffany H from LOVE this remote for business presentations! I received the Canon PR 100-R wireless presenter remote in exchange for posting a review. Having noted this, I would have purchased the remote anyway as it is a wonderful tool for business presentations! I used this in a training yesterday and have to say I was quite impressed. Setup is very simple and the laser is clearly visible when put to use. I also love the backlit timer feature as I had limited presentation time and was able to periodically make sure that I was still on track. Slideshow controls work with ease as well. Definitely worth the purchase if you do a great deal of presentations!